Preheat oven to 450 degrees. Lay a piece of parchment paper on a heavy-duty rimmed sheet pan. Place the salmon pieces at one end. Drizzle 1 tablespoon of the olive oil on the pieces, and season with salt and pepper. Top each with the parsley and dill. Mix the asparagus in a flat dish with the remaining 1 tablespoon olive oil, and season with salt. Place at the other end of the sheet pan, so all pieces lie flat. Roast for about 10 to 12 minutes, depending on the thickness of the salmon. Turn the asparagus halfway through. When the salmon is done, it should be lightly translucent. When lifting the salmon from the baking sheet, see if you can slide your spatula gently between the fish and skin, and leave the skin behind. Squeeze a bit of fresh lemon juice over the salmon. 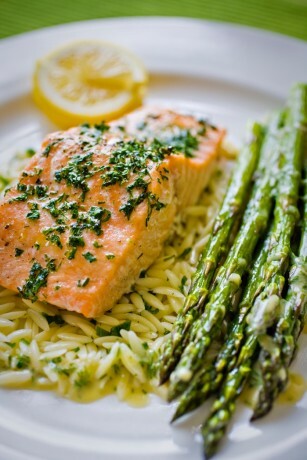 Spoon some honey mustard sauce on top of the salmon and asparagus and around the edges of the plate.